Home/Philippines • Politics • Society /Where? “Sidewalk Bistros,”Slice of Life by Larry Alcala (image: Google media). Can”t find Larry? Scroll to the bottom. 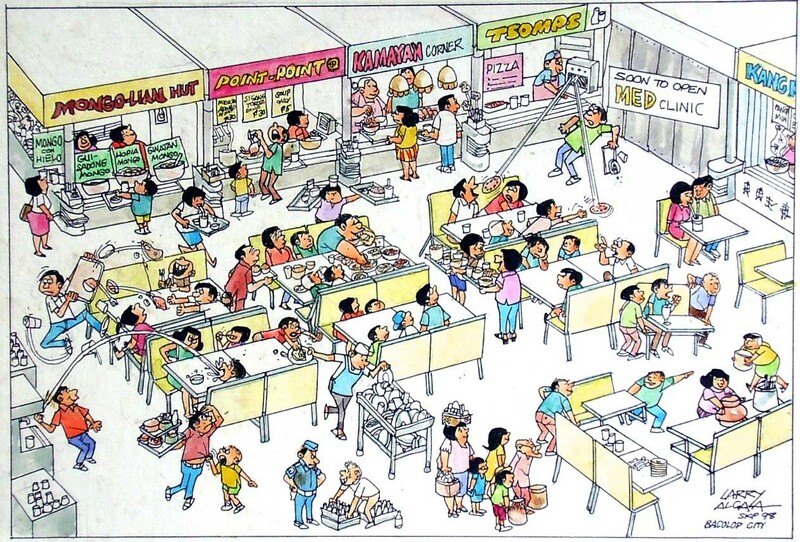 BACK IN THE DAY, Larry Alcala’s Slice of Life cartoon in Weekend Magazine was the highlight of our week. “Where’s Larry?” was the question; finding him was the goal. It wasn’t easy. Alcala’s icon was a caricature of his face and trademark moustache, which he hid in plain sight. I tried hard to find him in each issue and often failed. My Dad would throw the magazine at me over breakfast with a grin and the challenge, “Nakita ko na!” It tickled him that I usually lost our contest. This week totally felt like a Slice of Life cartoon. Where is he? It was a ubiquitous query and a legitimate one. Folks began asking it on Independence Day when he was a no show at the rites. Ernie Abella stuttered a reply to the inquiring media that in his opinion – and it was his opinion only – the president was busy with pressing matters related to the Marawi siege. Alan Peter Cayetano was slicker when he stated (from personal knowledge, mind you!) that the president was tired and taking much needed rest. I don’t play poker but I know how to spot a tell, and both these officials gave away their hand that morning. “Oh c’mon,” I said to them through the screen. “At least get your stories straight.” I wish they had heard me. The questioning intensified every day that he failed to surface. Koko Pimentel pompously pooh-poohed the fuss, saying, “Why make an issue of it?” Other chuwariwaps irritatingly chimed in. But the public would not be deterred. Not even photos of him released by the Palace on Thursday with guarantees that he was up and about satisfied doubters. One picture taken of him in his official quarters had a ridiculous “proof of life” angle, showing in the background the TV tuned in to the London fire. “See everyone, that was taken today!” it screamed. Why didn’t they just make him hold up the front page of some newspaper (not the Inquirer, of course); it would have done the job more credibly. Speculation reached a climax on Friday when Alt Malacañang tweeted that a full cabinet meeting had been called. Netizens were agog but were later deflated by the news that no meeting had occurred and that he was in fact in Davao; even Alt Malacañang recanted (probably losing whatever cachet it had, if it had any at all). Finally, he spoke to reporters on Saturday after visiting soldiers in Butuan City, saying he had merely been resting for the past five days. “My state of health is irrelevant… You must learn from Davao media. I do not need anybody to ask where I am going. Kasi pag di niyo ako nakita ng limang araw eh di patay na yan. So you swear in Robredo. Ano ba ang problema niyo? May bise presidente,” he said. He added mysteriously that he had been traveling “incognito” with his aide to “an undisclosed place in Mindanao.” That means of course that as far as he is concerned, where and why he went, and what he did there are strictly need to know. The president is no longer merely a mayor, and he is no longer dealing with just the Davao press. He cannot come and go or disappear at whim, or tell us he was sick and tired then in the same breath reveal that he traveled incognito to a secret location in Mindanao. Was he sick or not? Where did he go and why? If it is classified, then why hint at it at all? This is an issue of leadership, and he is displaying a lamentable lack thereof at this crucial time. Rodrigo Duterte is not only the commander in chief and the head of his cabinet, he is president of all 103,713,782 of us, whether we like it or not. He may not like it either, he may have preferred to remain mayor of Davao and the burnished icon of his adoring 16M, but he must take responsibility for all of us and do his utmost to maintain stability in every sector and aspect of society. It is immature to dismiss these concerns because the order of succession is in place. The very fact that the vice president is being relentlessly challenged should signal to Duterte, if he is truly the leader of us all, that nerves are wracked, fears abound, and that his assurances are required. If the 16M wonder why the rest of us are so frustrated by this presidency, it is because we have a leader who fails to unite us, who fails to inspire us, and who fails to provide the peace of mind and sense of security that we Filipinos desperately need. If to his die-hards he is the Punisher, the dauntless mayor of the Philippines, the maverick who doesn’t give a hoot about anyone or anything that gets in his way, then fine. I’ll give them that. But the rest of us are still in need of responsible, seasoned leadership by someone who can knit this tattered nation together. So the question was, where’s the president? I really don’t know. I’m still looking for him.